The implosion of an historic Detroit hotel on Saturday helped clear the way for a $650 million hockey arena that developers say will more than pay for itself in economic ripple effects, but critics see the demolition as the latest casualty of an ill-conceived scheme receiving public financing. The Red Wings will skate in a new arena slated to open in September 2017, the team and owner Mike Ilitch announced last year with splashy renderings and a pledge to “stabilize and develop dozens of underutilized blocks, create more jobs more quickly, and allow the city to spend public funds on other priorities.” But coming just weeks after Detroit became the largest city to declare bankruptcy in U.S. history, the Red Wings’ management came under fire for their plan to use $283 million in public money (mostly in the form of tax increment financing). Vacant since 2003, the 13-story Park Avenue Hotel apparently stood in the way of the new arena’s loading dock. Designed by Louis Kamper and completed in 1924, the Park Avenue Hotel was demolished over the weekend, its collapse captured in the drone video above. 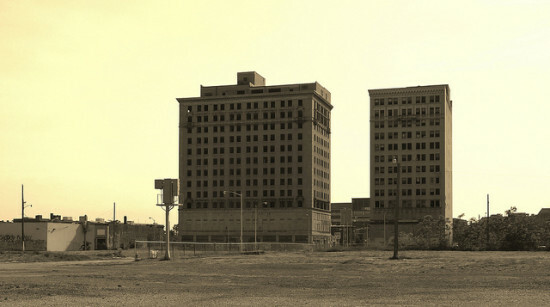 Since its glory days as a symbol of glitz in ascendant Detroit, the hotel had become a senior housing center and later a rehab facility. Locals gathered to bid the building farewell, reports the Detroit Free-Press. Meanwhile the public financing of arenas including the Red Wings’ has sparked debate about whether wealthy private interests need such incentives from cash-strapped municipalities and states. 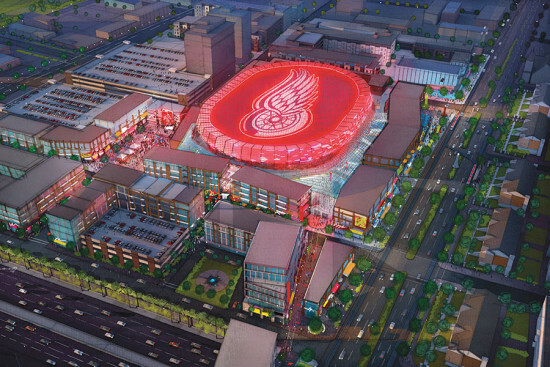 The same day Detroit leveled the Park Avenue Hotel, late-night comedian John Oliver ridiculed the taxpayer funding of sports arenas on HBO, calling out the Red Wings and Ilitch in particular. 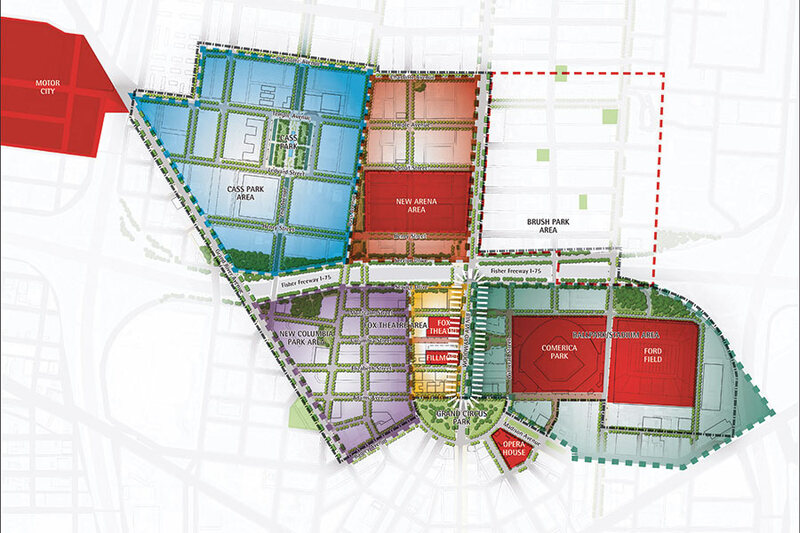 The Red Wings responded today with a statement, saying “This project is about so much more than a world-class sports and entertainment arena; it’s about transforming a core part of our city for the benefit of the entire community.” They did not, however, address Oliver’s disdain for Little Caesars pizza, which Ilitch founded.